It’s “Christmas,” not “Holidays,” Understand? 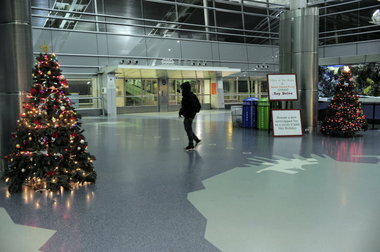 Until late last week, when I walked through the Staten Island Ferry terminal to go through my daily commute to Manhattan (I have been teaching at a college since April 2009), I saw that the waiting area had been decorated to suit the season: a Christmas tree, a Menorah and a plastic Nativity Scene. Last weekend, the Jewish holiday symbol was removed with the end of Hanukkah – as was the image of the Holy Family, replaced by an extra Christmas tree. The removal of the image of the Baby Jesus and his parents allegedly happened because someone called the 311 hotline (a centralized city service that deals with pretty much anything in the city except emergencies) to complain. Another story was that the plastic images were put there by an employee without permission of the DOT. The removal of the Nativity Scene caused much controversy in New York. 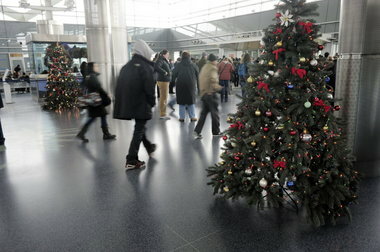 Many commuters criticized the move, stating that Christmas is about the birth of Christ, and that it has to be represented. Others pointed out that both Christmas trees and Menorahs are religious symbols (though the law does not stat that), and if one should be removed, the others should follow suit. Though I understand that we live in a society where church and state are constitutionally separated and that there should be no religious representations in public property (as is the case of the terminal), I think including a Nativity scene – specially on the Staten Island side, where the population is 60 % Catholic – is harmless. This brings to mind the whole thing about the whole “War On Christmas,” a situation that comes back every year here in the US where certain political correctness advocates rant about what they believe is the need to ‘secularize’ Christmas to make it more inclusive to people of different religious orientations. But the fact remains that Christmas is celebrated in many countries around the world – even in some where Christianity is not a majority (Turkey is one that comes to mind). To call a Christmas tree ‘Holiday Tree’ is criminal – do we call Menorahs ‘Holiday Candelabra ’ or something like that? I don’t think so. And I do enjoy the fact that we have the whole diversity thing going on, with different Holidays for different religions – I even have my own Menorah. I agree with your post, more than just secularize Christmas (which comes from the word Christ, as my name does too), companies and governments seek to make this a fit-for-all season. Jesus, who embraced everyone in his teachings, would be appalled, but certainly his protest would not be heard above the cacophony of the politically correct that favor the pasteurization over the richness of diversity. MERRY CHRISTMAS (LOUD AND CLEAR)! I would agree, except for the fact that decorating evergreen trees with lights for a winter festival predates Christianity.